It’s a big one. The most recent patch for Marvel Future Fight brings in 3 new characters: Elsa Bloodstone, Warwolf, and Lash. The new characters can be earned from the new Halloween stage featuring the Green Goblin. Three difficulty levels exist, ranging from from levels 10, 37, and 55. Each difficulty can be played 5 times a day, in which Halloween tokens can be earned. These tokens can then be exchanged for character biometrics. Alongside the new characters are 6 new uniforms: SPIDOK (A spidey costumed M.O.D.O.K. ), the original 70’s Blade, Modern Lash (as opposed to his default look which is based on Marvel’s Agents of S.H.I.E.L.D. ), the original 70’s Ghost Rider, Punisher Noir, and Black Cat’s outfit from the limited series Wolverine and Black Cat: Claws. Only Ghost Rider, Lash, and Punisher’s costumes are being sold at the moment. They’ll be available for 6 more days before the last 3 are switched out to be sold. All costumes can be bought for 750 crystals each. See below for costume bonus stats. 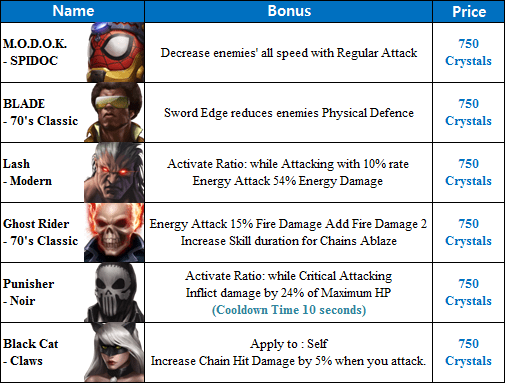 In addition, Thor, Blackbolt, and Punisher have now received skills for 6* rank.